King Ludwig II of Bavaria has called all great architects to design his greatest achievement: a world-renowned palace. Only the best will do! Gorgeous appointments, white stone, surrounded by water, with swans everywhere. Oh, and the Ludwig touch? All the architects must design the palace together. The designer who shows the strongest influence will receive the order to build it. 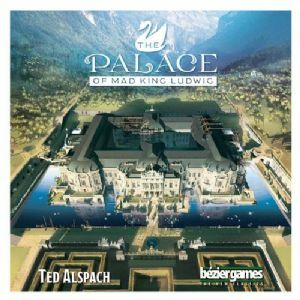 In The Palace of Mad King Ludwig, each player builds rooms one at a time in a single gigantic palace. As rooms are completed, a moat slowly forms around the outside. Once the ends of the moat connect, the palace is finished, and the player who has contributed the most to the palace wins! In more detail, this sequel to Castles of Mad King Ludwig shares a few similarities to its predecessor, such as tile-laying, room rewards, and the magic of watching a unique palace take shape through the course of the game, but the gameplay is entirely different, with no auction, a clever endgame timer that graphically builds pressure for players as the moat slowly closes in around the palace, and a twist on resource management with multi-colorued swan tokens being used as currency, points, and the keys to new abilities. Between Two Castles of Mad King Ludwig is a competitive tile-drafting game in which each tile is a room in a castle. You work together with the player on your left to design one castle, and with the player on your right on another castle. Build the biggest and best castle for King Ludwig room by room, but he is a bit mad and changes what he wants constantly, can you end up pleasing the King? Swans, moats and secret passages, just a few extras to incorporate into your designs to please the mad king.